Our first restaurant, Zubuchon Mango Avenue celebrates its first anniversary on Saturday 16 June 2012! I can barely believe it’s been that long… and we are most grateful to all of the folks who have come to try our food and many who returned again and again over the past year! 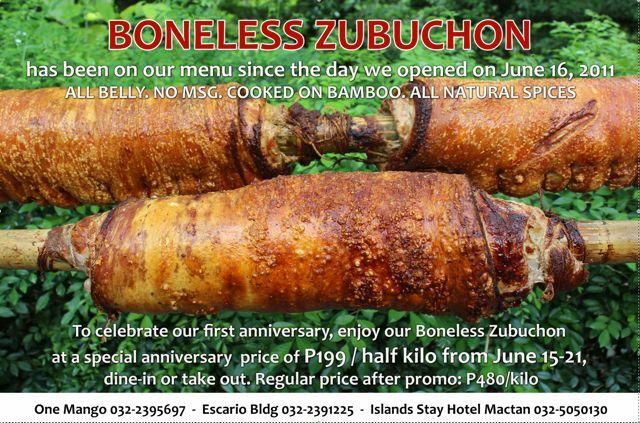 To celebrate, we are offering a special deal on our Boneless Zubuchon or the rolled pork belly (originally referred to as Zubuliempo) filled with herbs and spices that is slow roasted on a bamboo pole over charcoal flames. Half page advertisements announcing the special will appear in Cebu daily newspapers on Friday and Saturday, but the offer is good until June 21, 2012, while supplies last in the branches. At PHP199 for half a kilo, or PHP398 per kilo, it’s a real steal! If you love boneless pork belly or liempo, it’s a must try! For regular blog readers, you will recall I posted a homemade porchetta or rolled belly home version done in an oven, here, in September 2008, and visited a small shop named Porchetta in New York in November 2009 to check out their much lauded porchetta sandwich… This was followed by my experiments with rolled whole bellies over charcoal in February 2010, here, and did other belly (liempo) experiments here, with various herbs and spices. We introduced the rolled belly when the restaurant opened in June 2011, and it’s been on the menu ever since. 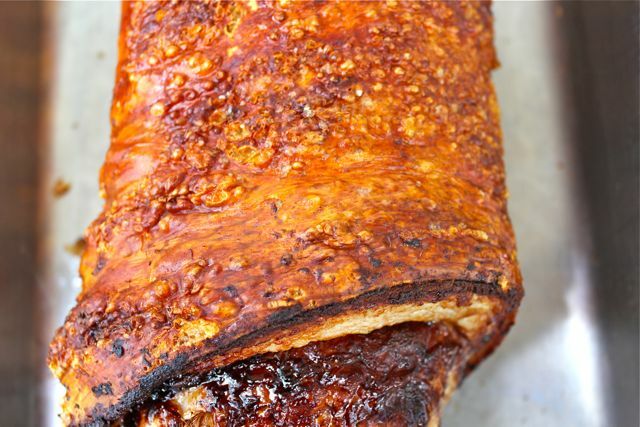 I most certainly got the initial idea for a roasted rolled belly from other sources (the Italian porchetta definitely the key reference point) and have never claimed to have invented it, but I will say that I think Zubuchon was probably the first to offer a version of it in Cebu City. The good and bad news about the internet is that it makes recipes so accessible, and easy for folks to copy. The bad and good news is, when someone else tries to claim that they are the “original” — defined by the Free Dictionary as “preceding all others in time, the first” or defined by Merriam Webster as “that from which a copy, reproduction or translation is made”, then the internet is a great source for timelines that make it clearer who did what, when, where, why and how, FIRST. Amazing how time flies. It’s been a year already?! 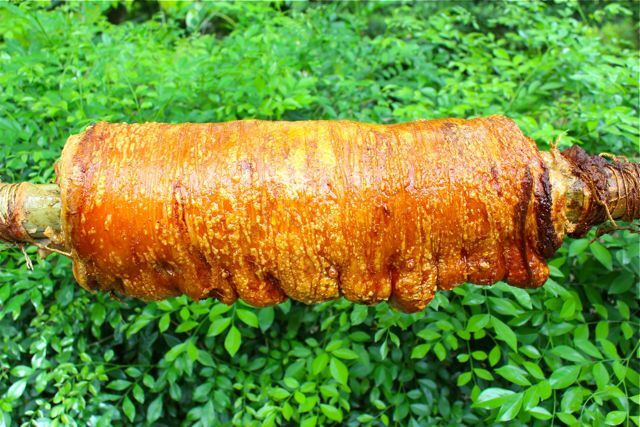 Please don’t ever stop making great lechon! Congratulations MM and the Zubuchon staff. Yummy Boneless Zubuchon at a great price. i can’t wait to come to Cebu! Yummy! Happy anniversary and more power to you MM! Happy anniversary! Hope to taste that beautiful pork one day. i am sharing this link to my Facebook, MM. lag lag panga ang magbabasa into. this is so good… i cannot wait to try this one. Congratulations MM, family and crew. Happy Anniversary! omg, mouthwatering! i wish i’m in Cebu right now! Happy anniversary and congratulations to you and your entire crew, MM! Congratulations and Happy Anniversary to the Zubuchon Boss and Crew. Congratulations! And what a treat! Congratulations on Zubuchon’s 1st Anniversary! Congratulations to you and your crew! One year already?!? It seems just like yesterday and I haven’t even been there. Happy Anniversary and Wishing you many, many more! CONGRATULATIONS TO MM AND CREW!!! We wish you the best, MM! congratulations, MM and family and crew! great job! here’s wishing you millions of lechons sold! Congrats MM! I can still remember that series of liempo experiments and how hungry it made me reading those posts. Congratulations! Wish we could go back to Cebu. Craving for Zubuchon and iba shake! OMG! torture ito! am trying to eat healthier and yet the pictures on this post kept me salivating for roasted liempo! Congratulations Zubuchon!!!! More power to everyone behind all these…. Has it really been a year already? Happy birthday Zubuchon! MM, Congratulations…I am one of the fortunate readers of this excellent blog that lives in Cebu…So YES, I will be there this weekend!!!! again congrats to you and your Crew, because you know you cannot do it without them…. OMG. I texted my sister right away after i saw this! Hahah magpapa-uwi ako nito!!! Any branch po, right? What a way to post my first comment than to congratulate you and Zubuchon staff on your 1st year anniversary!!! I’m an avid reader of your blog for sometime now (I’m one of those lurkers, always visits your blog but never posted a comment until now). I came across of your ad-free blog when I googled “dalandan” and yours was on top, from then on I was hooked. Your blog inspired me to re-learn my love of cooking. I just want to thank you for your never ending quest to experiment on recipes, inform us about day to day life in the Philippines, educate us on your rants/raves and most of all to write a post such as this. Once again, congratulations and all the best to you!!! I am trying to swear`off pork and when I cover food events I always only take a bite to be able to describe it in my article. For the Zubuchon Belly Roll and Monggo I will break my no-pork diet come Christmas when we go home to Cebu. I appreciate the all natural ingredient effort you and your team tirelessly make! Hi Everyone, first of all, my sincerest apologies to any readers or customers who visited our branches this lunch time and were unable to purchase our Boneless Zubuchon. After the advertisement came out in the newspaper this morning, our phones were ringing off the hook for several hours and people made reservations for both take-out and dine-in orders, rapidly depleting the stocks we had scheduled for the lunch time crowd. The response was much stronger than we had anticipated and we are trying to adjust the amount we cook for dinner tonight and for the next few days to try and meet demand. Thank you very much for your continued support of Zuubuchon, our staff and management greatly appreciate it! :) For those of you who would like to avail of this special offer, I strongly suggest calling any of the three numbers in the first photo above to reserve your Boneless Zubuchon several hours in advance to ensure we have set it aside for you. Thank you! My goodness, that boneless piggy looks sooo good! Congratulations on your 1st Anniversary! What a treat to Cebu residents and your loyal diners and a real tease for us who read your blog and can only dream of taking a crunchy bite. Here’s wishing you and Zubochon and its crew many happy piggy moments! congratulations and more power, marketman… one year yung zubuchon di pa ako nakakapunta dyan.=( makahanap nga ng seminar sa cebu city. hehehe! So, it has been a year since I started hoping that Zubuchon will find its way to Manila… Congratulations MM and crew. It’s been close to 6 months since I was in Cebu just to try Zubuchon and I still dream about it… Thanks for the awesome dining experience! Congrats po! God bless and more power po! Congrats also to the upcoming expansion….Saw the pig logo (what’s the mascot name) coming soon sign the other day!! Mazal tov! Happy 1st Anniversary to Zubuchon. Congratulations! Those lechons are mouth-watering! omg! that’s salivating. cheers to many years of superb food! Yep, there’s always somebody whose kicks lie in spoiling other people’s enjoyment. They should be beaten about the head and neck with a Lodge fish skillet. Congrats!!!!! how time flies so fast….. ayear ago EB. Congratulations MM! Been thinking of booking a flight to Cebu, just to dine there. Cheers! congratulations mm! i do not travel to cebu as much as i would want, but whenever i am there, i definitely hit a zubuchon. in my own little way, i have persuaded some 5 to 7 cebu-bound individuals (not part of the mm legion) and their group to eat in your restaurant. I believe this has translated into about 15 zubuchon dine-ins, and a lot of zubuchon converts who have, themselves, also spread the word. OMG! One year already. How time flies. Yummy, lami kaayo ang pictures. I can just imagine the crunch. Congratulations to you, Mrs. MM, the Teen and the crew. Well done. Congratulations MM and crew….how time flies. i was those who attended the opening if zubuchon in One Mango and now ur turning one year old. More power and success. Congratulations MM and crew! Great job! Congratulations! I hope to visit Cebu soon so I can buy again some kilos of Zubuchon to bring to Manila. Lami kaayo! Congratulations Zubuchon Mango Avenue. Hay, how I wish I can avail that promo here in Manila. But I tasted Zubuchon na when we were in Cebu Dec 2010. Yummy to the max. Congrats! Been suggesting zubuchon to all my friends who are going to Cebu. Happy Anniversary to Zubuchon! More good eats to come. congratulations MM! God bless u with more years at Zubuchon! Wow.. One year :) Congratulations! Happy Anniversary! I’d definitely come back to Cebu once I delivered my baby. More power to you and your crew!